In his magnum opus, "The Leviathan", Thomas Hobbes provides all of the necessary parts to tell a compelling story in understanding the human condition. One of the theories he proposed opined that, "Good and evil are dependent on what the individual loves, what he or she seeks, and hates, and what she or he avoids." It was from the above premise that he arrived at the conclusion that "Man is inherently evil ". Having said that, no situation, describes the evil nature of man, and man's desire to advance his position at the detriment of his fellow man, other than the Nigerian situation. Recently, it can be vividly observed in the compromised manner, the Nigerian media tried so hard to manufacture an alternative and fake reality in reporting the just concluded Local Government elections in Enugwu State. Channels Television in particular, was unashamedly biased and generous with their lies that they cooked up video from the 2015 general elections, in order to belittle and discredit the successful boycott of Enugwu state local government area elections by Biafrans. From the way and manner they reported the events of that election, you could feel they were in pain like someone whose bad tooth is being removed with a sledge hammer. The truth of the situation is that, yes, Nigeria was never meant to be one, Yes, we have had the curse of bad leadership, Yes, we have had kleptomaniacs as political leaders. But the highest impediment to good governance, Justice and equality in Nigeria is the morally bankrupt and heavily compromised Nigerian media. The Nigerian media (especially those in the TV and print media), are masters of deception and fake reality. Once the brown envelope have exchanged hands, pure journalism and truth is up for grabs. It is now left for the highest bidder to determine the way and manner they go about their news reportage. With the right amount of cash, Nigerian media can turn the devil himself into Angel Jubril (Angel Gabriel). Once you press their button with the right amount of cash, truth and justice will be murdered in it's infancy by these media abortionists. 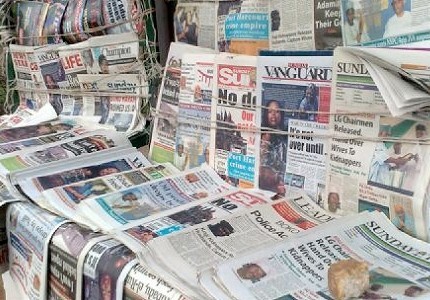 Nigerian journalists commit crimes against humanity and enable corruption thereby participating in the process. For the avoidance of doubt, the Enugwu State local government elections was avoided like communicable disease by Biafrans, who have determined that the only voting process they will participate in, is a United Nations monitored Referendum. Any other information to the contrary, being disseminated by the cesspool of putrefaction that is the Nigerian media is just entertainment for the gullible and zombies. Across all the 17 local governments in Enugwu state, the election witnessed in estimation, 97% election boycott by Biafrans. The Nigerian media, especially Channels TV should quit painting an alternative reality. The least the suffering masses deserve at this time in this country is the truth. Lies comforts, but truth heals permanently as there is no substitute for truth. However, Biafrans do not expect the Nigerian media to change, because it is easier to pick an addiction than to drop an addiction. But let them know, that what will happen in Anambra come November 18th will be devastating for their lies. The boycott will be so massive and the silence will be deafening. Finally, Biafrans all over the world, should not be discouraged by the brazen manner with which the Nigerian media manufacture fake reality. Truth is dead in Nigeria. That is why an unarmed Indigenous People Of Biafra- IPOB can be classified as "Terrorists" and no one in the print and TV media is making noise about it. That was why, one of the steps taken by the IPOB leader Mazi Nnamdi kanu, was to ensure we have a vibrant Radio which is indigenous to Biafrans, that transmits nothing but the truth, from where the evil hands of Nigeria will never impede it's operation. As for the Nigerian media, they have sold their conscience for porridge, and are capable of genocide without firing a weapon. Biafrans in Anambra State should not be discouraged nor disillusioned, November 18th is our date with destiny. It is still "Ofe Nsala day", and nothing has changed. It is the day we are going to take back our sovereignty. It is the day we will renounce this evil Republic, and take a giant step towards the restoration of our Homeland- Biafra. All hands must be on deck, and efforts intensified to ensure that Anambra State gubernatorial election is successfully boycotted. "Cha! Cha! Cha! Enugwu Nile kweenu!